Haven't been around here much. The past many months brought major life event changes. Some things such as Studio LuLu were put on hold while the other parts of life took over. Vision problems, deaths in the family, a major relocation, spine surgery, ....you probably know how this goes. Anyway, it's time to get back in the creative groove and get some artwork flowing. It's a difficult thing to pick up where I left off so I'm trying my hand at more mixed media and getting messy at the art table with wet paints, block printing, collage, and drawing. 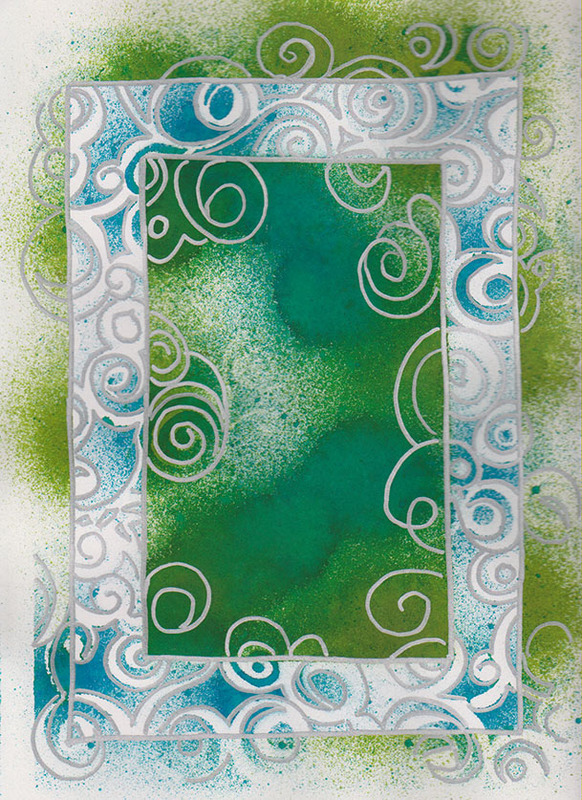 To jumpstart the creative flow, I'm participating in The 2016 Art Journaling Adventure which provides inspiration for this return from the last year. Diving in at week 16 ( I know, a little late) had to do with creating frames on journal pages so here goes. 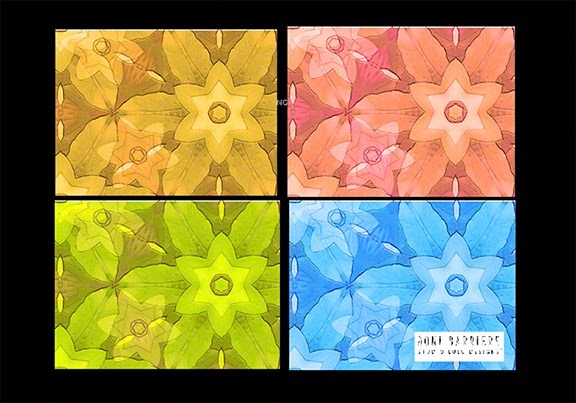 My undivided attention to creating kaleidoscope designs has me spinning lately. 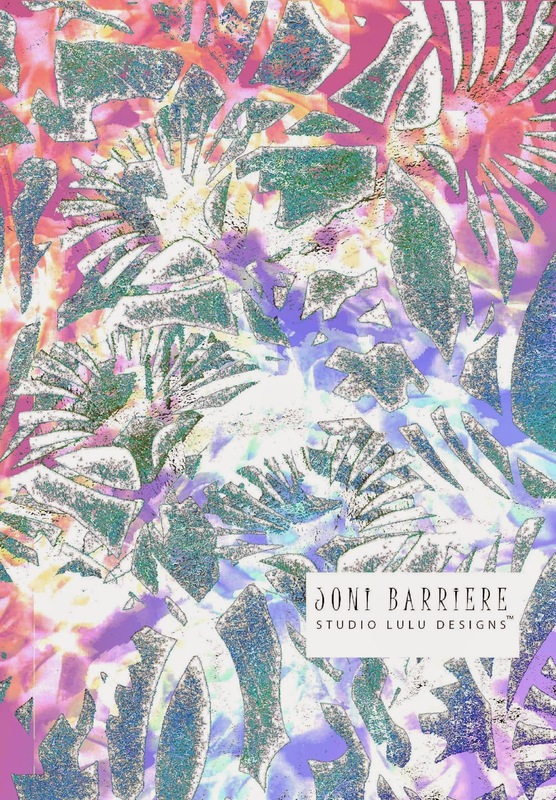 This panel was created for a recent fabric competition. The intention is to provide sewists and quilters with a panel of cutouts ready to stitch into absolutely anything. 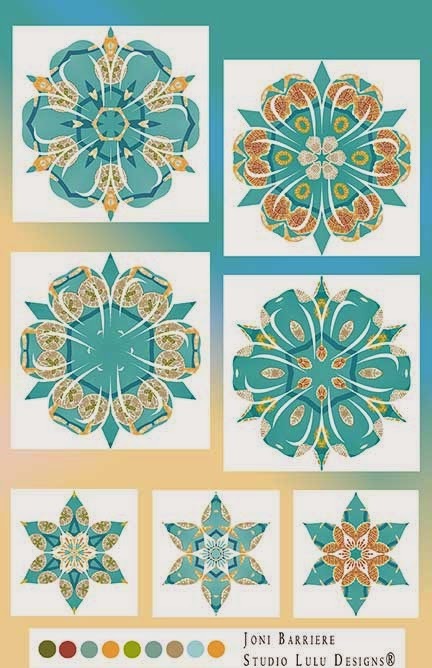 These designs are great for home dec projects such as pillows, table runners, mug mats, and coasters. Just cut out and add a border if you like. Looks like fun to me! I'll be posting more once I find a fabric printer to create the yardage. 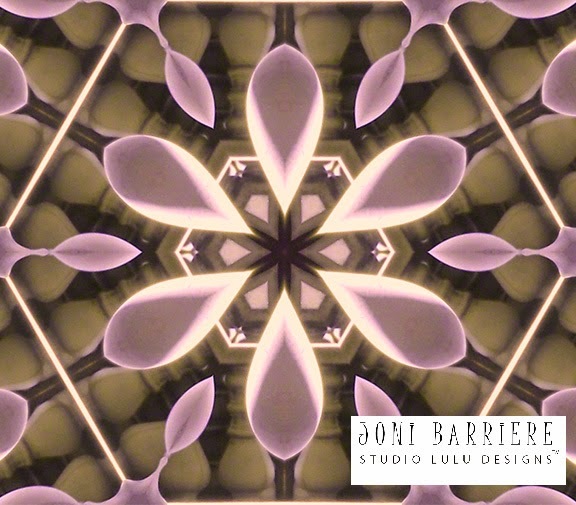 Trying to do a little stress management during this last week of the year has led me to creating these repeating shapes of kaleidoscope patterns. 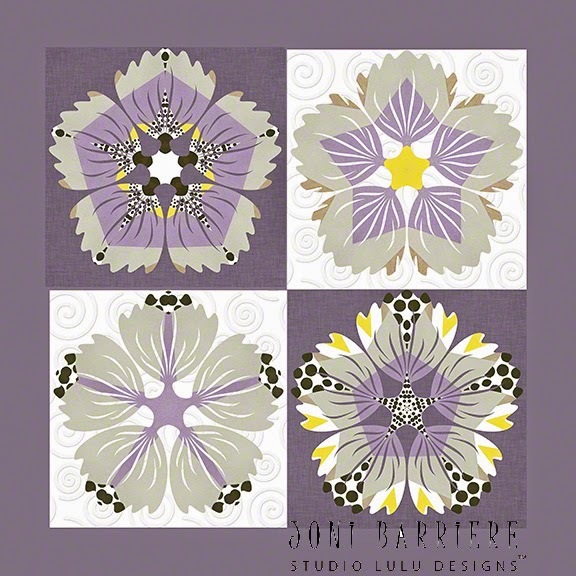 I choose a muted orchid color since the burst of radiant orchid began the year as Pantone's color for 2014. The color has done it's job for 12 months and no doubt will continue to appear even though 2015 will herald in Pantone's color of the year named Marsala. The challenge will be to pair up Marsala with other compliments to bring it to life. 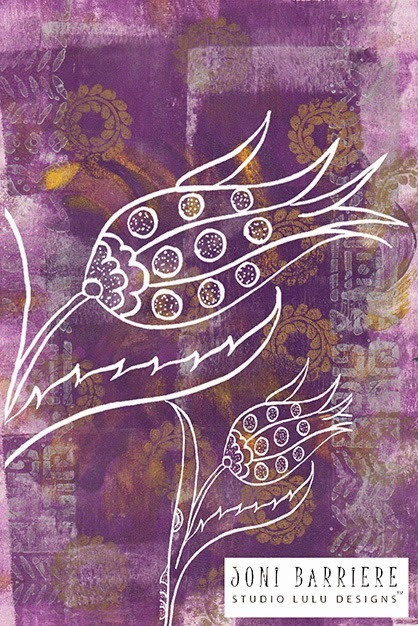 Meanwhile, it's adios to radiant orchid for now and back to creating more kaleidoscope patterns for stress relief. It's a lot more fun for me to dream up patterns than to attempt to sit in meditation! Somehow these past few weeks have resulted in an artwork lull as I've been pursuing more of an interest in the fine art of serious pencil drawing. The magic of hand drawn artwork involves a time consuming aspect that defies the clock. I can sit and draw for most of an afternoon yet create much less artwork than I can produce with paint. There's something meditative about drawing that calms the nervous system although the eraser seems as important as the pencils! I realized I had started this challenge piece called Pastel Palette before my immersion into pencil drawing and decided today to put the finishing touches on it. The lure of pencil drawing however has slowed down my day to day participation in the 101 Day Challenge. Still honoring my commitment to the 101 Day Challenge, I know it will take on a more long term process. This means that I will be posting my mixed media artwork in varying intervals. I am sharpening my pencils the rest of the time! Dreaming of the shore again today. Just can't seem to get enough shell icons and sand dollars! 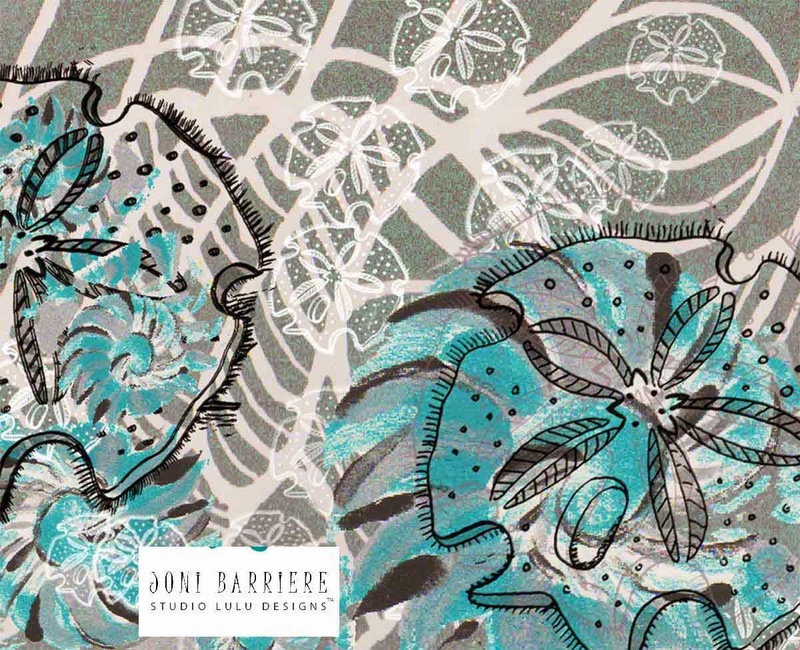 Block print background of an abstract shell outline was layered with a second abstract shell block print which added aquamarine color to this artwork. The line art of the sand dollars spiced it up a bit. Although a very busy print in the end, I enjoyed becoming engrossed in the process of using previous block prints and adding new elements to create this one. 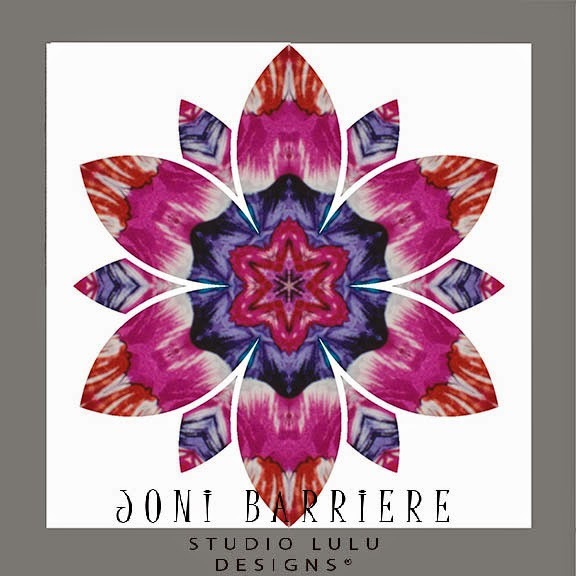 Playing with digital tools today resulted in the kaleidoscope effect for Hibiscus Tile. The layers have some very fun shapes that might be a starting place for other artwork. Changing up the colors on this painterly piece using warm to cool gradations. I could have continued with so many variations of color but choose to display just these favorite ones.